Want your business card to reflect your gleaming personality? Adding a touch of foil can do that. Did you know foil stamping comes in more colors that just silver and gold? If you cannot find the right color from our chart, let us know and we can get you the closest match. Additional charges may apply for foil areas larger that 1″ X 2″ or more complex designs. 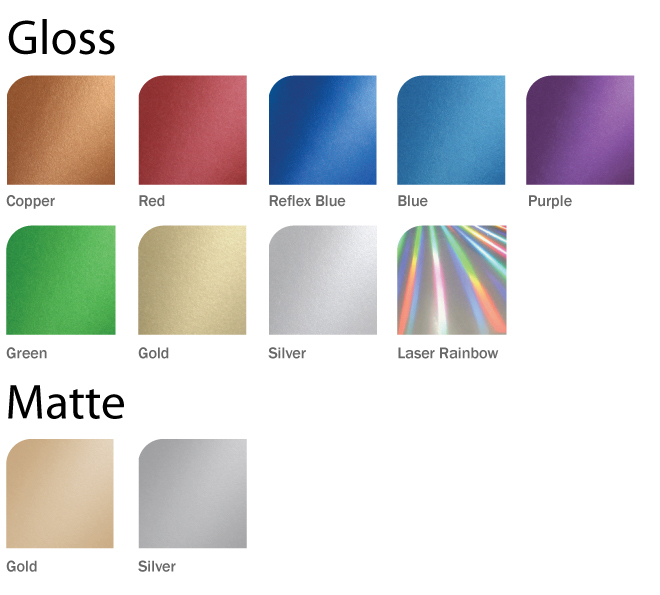 Our foiling color are listed below. Does pricing depend on how large the foiling area is? Yes, foil pricing depends on overall size, registration difficulty and quantity. Is there a limit to how complex my design can be while still being able to apply foiling it to? Yes, there is a limit to small print and fine lines. Lines cannot be thinner than 0.25pt. Same apply to all small prints. Also we do not suggest to design fine details along with a large solid area. What is the process of foiling? Foil stamping is a process that we use heat and pressure to release a designed shape with a metal die and hot foil tape on top of the printed substrate. The making of the die is a stand alone process that takes about 2-4 days. Can i foil more than one color? Yes, you can foil as many color as you want, each color will be treated as one single process. How tight is your foil registration? There are 1/32″ registration error in average. Do i need to pay for foil stamp set up each time? Even if I'm reordering my cards? No, foil die charge are included for repeated order forever. If we damage it or for any wear and tear issue, we will make a new one for you. Can I apply SPOT UV on the foiled area? Spot UV will be apply on top of foiled area. Can I emboss the foiled area?